38 pp. Roman, 1081 pp. 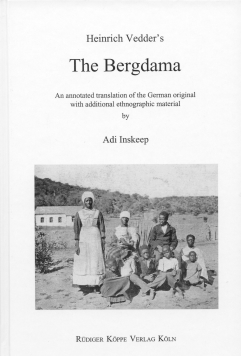 Since its publication in 1923 Heinrich Vedder’s monograph on the people and culture of the Mountain Dama of Namibia has been acclaimed as a classic of German ethnography of Africa. 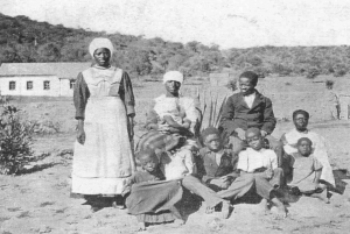 Prior to the immigration of Bantu-speaking Herero and the predominance of Khoisan-speaking Nama groups, Namibia was probably solely inhabited by San and Mountain Dama. The latter’s economy centred on hunting and gathering, yet included some gardening and small animal husbandry. They produced and worked with copper and iron. Though they were soon overpowered by the politically dominant immigrants, they were not eliminiated or evicted but absorbed into a subservient position. The South-African socio-anthropologist Adi Inskeep has been working intensively on the Mountain Dama for twenty years. During several extended field study sojourns in the Dama settlements she systematically gathered and analysed the widely scattered literature on this ethnic group. The book consists of three parts. The original text of H. Vedder forms the focus of parts I and II. It was translated into English and provided with an extensive critical apparatus, clarifying the more obscure passages in the original text and especially weighing the statements contained in the light of current scientific research. Part I deals with the structure of society and material culture, part II illustrates oral literature. Collateral English translations of the Dama passages in the original text have been included. The final part of the study is based on Adi Inskeep’s own research and a thorough reading of the relevant literature, placing the Mountain Dama into the wider ethnic context of South Africa and discussing the ethnogenese and history of the Mountain Dama. Following the link at the bottom, you will find the full text of the review by George T. Nurse. These two volumes are likely to remain essential items for any study of African peoples in general, and though one cannot but decry the fact that they have waited so long for translation into English and for an expansion such as has been made here, they can only be welcomed by those engaged in study of Namibia and its peoples.